I’m getting a bit worried because I find myself agreeing with chelsea fans! Always enlightening to find out what the opposition fans think and Chelsea definitely aren’t expecting a walkover today judging by their top independent website CFCNET. Especially interesting to hear what they have to say about players such as Ben Arfa, Ba & Cisse and especially Jonas – read on. ‘We all recall the two wonder-strikes by Papiss Cisse that condemned us to defeat, and we will look to not let that happen again, especially since reinforcements are on the way. This is a winnable game, but it’s also our sternest test outside the Community Shield. Newcastle are a side that will expect to once again challenge for the top 4 and will see this as a chance to take 3 early points, knowing full-well that they did so last year. Cisse and Ba are clearly the two danger men for Newcastle United and will be a slight worry for the pairing of David Luiz and Gary Cahill. John Terry is set to miss out with a slight injury. The concern for the back line is the threat of both Ba and Cisse in the air, given how easy Pavel Pogrebnyak ghosted past Cahill for the first goal for Reading, and their skillfulness on the ball, as shown by the wonder goals from Cisse last year. These two as a partnership are a danger, and Pardew has seemed to work out how to get them both in good positions. Against Tottenham, both provided intermittent threats, but their lack of overall service has to be credited to the way that Tottenham’s midfield pressed and starved them. The goals came after they started to lose energy. 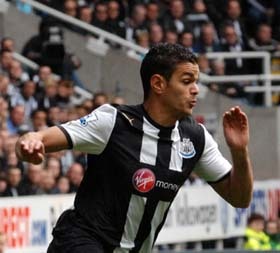 If Hatem Ben Arfa would have had a better overall attitude, work ethic, and not so many niggling injuries, Ben Arfa would have been a fixture in the France side and a much bigger club than Newcastle now. Back in his younger days at Lyon, Ben Arfa was considered the heir to Zinedine Zidane’s number 10 role and a better overall prospect than Samir Nasri. However, falling out’s with managers and niggling injuries gave him a reputation as a problem, and his options for playing at big clubs became limited. However, he’s still just 25, and his talent is still there, even if the broken leg has robbed him of pace. He will start on the right hand side, but with Jonas balancing on the left, he will have the freedom to drift into the center. His ability to create alongside Cisse and Ba’s ability to alternate playing target striker or second striker makes the three players a lethal combination and leads to them threatening a backline. Chelsea must be acutely aware of this for reasons that will be stated at number 5. Jonas is the unsung hero of the attacking players. 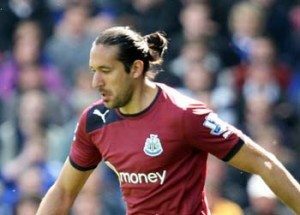 When you think of the Newcastle side, Jonas is one of the last players that pops into your head, but he’s one of the most important. It’s his versatility at being able to play both centrally and in wide areas that allow the front three of Ba, Cisse, and Ben Arfa to operate. Jonas abilities permit the team to either attack using 4-4-2, 4-3-2-1, and the ability to play in a 4-4-2 diamond, depending on the control of the midfield. That tactical flexibility means that Pardew can change systems without making changes, and it also means that they players can shift them on their own. Our formation’s midfield setup will be tested, first with Cheick Tiote and Yohan Cabaye. If Jonas is the unsung hero that allows the flexibility of Newcastle, it’s Tiote and Cabaye that provide the engine room behind it and the ability to distribute the ball. Tiote has developed into one of the best holding midfielders in the Premier League and gives them steel in the middle to break up attacks. Cabaye gives Tiote a partner with a bit more flair to his game and the ability to pick out a pass. It will challenge the center midfield of Frank Lampard and John Mikel Obi because ball retention has been something that they’ve struggled with as of late. Which leads us to the last and final point: Chelsea must tighten up the midfield and the defense, or Newcastle might run roughshod through us. For all the money spent on attacking players, our biggest concern this season will be adapting to the 4-2-3-1 of Roberto Di Matteo while also not conceding goals. Our biggest problem lies in that Lampard/Mikel partnership deep. Since the player in the hole behind the striker is Juan Mata or Eden Hazard, it’s imperative that Lampard and Mikel take up deeper positions, if for no other reason than to close the gap between midfield and defence. However, what I’ve seen in the first two matches is that Lampard is still Lampard, and he wants to spring forward in the attack. There have been numerous occasions when Lampard was further up the pitch than Mata, and Mata was forced to come deep. If Lampard is going to burst forward as is his tendency, it exposes Mikel because he already has to take up a higher position than a holding midfielder usually does in order to cycle the ball. Mikel is then left to cover the space behind Lampard, while also watching for diagonal balls and space behind himself. This gap behind the midfield and defence is a problem because both Wigan and Reading found it, and Manchester City with Carlos Tevez and Sergio Aguero exposed it. They get in behind Mikel, attack the two CBs by running at one of them, and opening the space behind that CB to attack. Lampard must sit deeper and restrict his forward movement. Otherwise, that gap will keep appearing and any time possession is lost without it being a goal kick, our CBs are hung out to dry. This is our toughest league test to date, and it might prove a sticking point later on if it proves to expose a weakness. The Blues must also find some continuity in their play, but part of that stems from a lack of training time as a full unit with Olympics and holidays and such. Hopefully it will be Newcastle United laying down a black & white marker….